The men (often with a thousand pounds of iron connecting them) were part of a coffle, enslaved migrants walking seven or eight hundred miles, chattel property, being moved from the north to the south because the profits when they were sold to their new owners were one hundred percent. The slave trade in Africa no longer mattered because slaves in the more northern states (Virginia, especially, but also Maryland) were reproducing so quickly that they created an entire new source of labor. Baptist gives the year as 1805, and states that eventually a million slaves were herded this way to the South. Tobacco farming in the North was less profitable than cotton farming in the South. “The coffle chained the early American republic together.” Slaves walked and walked for five or six weeks, performing their ablutions as they moved. There wasn’t an iota of dignity for the men. Baptist refers to the entire procedure as a “pattern of political compromise” between the North and the South and notes that eight of the first twelve Presidents of the United States were slave owners. The movement of such huge numbers of slaves to the part of the country that could more productively use them was a “forced migration” grounded on “forced separations, violence, and new kinds of labor.” Equally disturbing—and this is the thesis of Baptist’s magnificent book—“all northern whites had benefited from the deepened exploitation of enslaved people.” Thus, the-half-has-never-been-told1there are no chapters on the African slave trade or the Middle Passage here, but a focus instead on what might be called the second stage of slavery in America. The movement to the deep South would continue for years because of increased productivity of the slaves themselves. In the North, one hand usually sufficed for their work (the dominant hand) but cotton picking required the complicated dexterity of both hands working together. The plantation owners developed something known as the “pushing system,” forcing the cotton pickers to increase productivity. There were quotas and severe punishments for those who failed, and if a slave had a day when he (or she) picked more than any other day, that became his (or her) new daily quota. Torture for failed quotas was endemic. All white people in the country benefitted, even though some northerners insisted they were no part of it. Fortunately, by the 1820s, there were increasing pronouncements from white Americans that slavery had to end. And there were increasing narratives published by slaves who had escaped that showed their limited number of readers just how appalling the entire system was. As I said earlier, Baptist relies on these accounts extensively, plus the isolated reports of a number of attempted revolts such as Nat Turner’s. Christianity was also added to the fray, both as a justification of slavery, by some, and hope for many slaves who had been converted. When you consider the long-term effects of slavery, reaching into our world today, it is possible to say that the lives of African-Americans are substantially better than they have ever been before, but when you examine the actual economics impacting black people’s lives, you see a much different picture. Numerous articles in the press during the past few years provide a bleak picture of black people’s living situations. The gap among races widened during the recent economic recession. According to an article in The New York Times in August of this year, “The net worth of the average black household in the United States is $6,314, compared with $110,500 for the average white household, according to 2011 census data. The gap has worsened in the last decade, and the United States now has a greater wealth gap by race than South Africa did during apartheid.” That’s as damning an indictment of the long-term results of slavery in America as possible and something to consider when reflecting on the half-assed analyses of the recent riots in Ferguson, Missouri. Edward E. Baptist’s brilliant book, The Half Has Never Been Told, soars because of the author’s decision to root his analysis in the human dimension. The book transcends anything that has previously been written about slavery. Dozens of individual slaves are named in the study and their lives successfully worked into the lengthy narration of the legacy of slavery in our country. In short, Baptist has humanized the lives of American slaves, liberated them from one of the most inhumane systems mankind ever devised. The entire country needs to do the same. 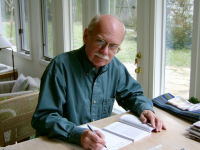 Charles R. Larson is Emeritus Professor of Literature at American University in Washington, D.C. Email: clarson@american.edu. This article first appeard in Counterpunch. 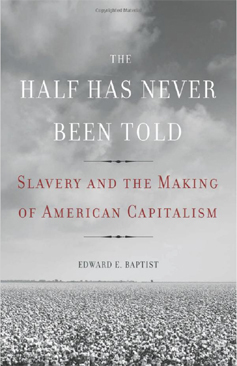 Article foto: Edward E. Baptist: The Half Has Never Been Told: Slavery and the Making of American Capitalism.